Fiat CEO Marchionne says government subsidies have led to 30 percent production overcapacity in Europe. FRANKFURT/BRUSSELS (Reuters) -- General Motors Co.'s drive to revamp its Opel/Vauxhall operations will only make a small dent in the European auto industry's overcapacity as high closure costs and political concerns prevent sweeping rationalization. GM is grappling with heavy losses in Europe and has said the future of its plant in Antwerp, Belgium, and its 2,300 workers, is uncertain. Analysts doubt that a large-scale shrinkage desperately needed in the wider European auto industry -- home to roughly 100 major car plants and about 20 percent overcapacity -- will take place in 2010, given the profound effects it would have on over 12 million jobs depending on car production. There is little incentive to be the first to act since car site closures can cost hundreds of millions of euros, spark bitter conflict with unions and governments and lead to a loss in market share, even if the industry as a whole benefits. IHS Global Insight says that on average 80 percent capacity utilization is required to break even and sees the rate rising gradually to 75 percent by 2015 from its current level of 59 percent. In the boom year of 2007, the rate was 83 percent. PriceWaterhouseCoopers estimates excess production in the European Union at 6.8 million vehicles, even adjusting for plants that have already cut shifts. "Based on an average output of 300,000 vehicles annually per site, this translates to 22 plants -- and in 2010, excess capacity could surpass 7.2 million units," said Calum MacRae, global leader of the PwC Automotive Institute. Embattled carmakers are scrambling even harder to keep their expensive western European auto plants open and avoid big payouts by modifying factories. IHS Global Insight production analyst Francisco Carvalho said Europe tends not to close plants but transform them by removing a production line or converting them to engine factories or distribution centers. In many other industries, companies allocate resources only to the most efficient assets, but carmakers spread the pain by cutting shifts, swapping volumes between plants or temporarily idling sites on a rotating basis for one or two days per week. "I see thinning out of staff on a big, big level. There's an awful lot of reining in possible between a three-shift system running 24 hours a day and a one-shift system that might still be producing a fair number of vehicles," said Nick Margetts, the managing director for Jato Dynamics in Germany. Such measures can cement a productivity gap between plants that can range from under 20 hours to build a vehicle to over 60, according to industry efficiency guru Ron Harbour. It is easier to close a plant in countries such as Britain due to more liberal labor laws or in Belgium because the potential impact of a consumer boycott will be smaller given it represents only 4 percent of the western European car market. 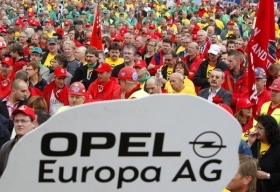 Opel workers in Antwerp demonstrate to save their plant. GM's Antwerp facility, which may be wound down once production of the old Astra cabrio and three-door runs out, would not be the first Belgian plant to close. Renault shut its Vilvoorde plant on the edge of Brussels in 1997, with limited long-term impact on sales. "The economic differences between the (Opel) plants are really very small. One must close," said Jo Van Biesebrock, a professor at Leuven University, arguing that Belgium has also suffered from a lack of a large supplier network compounded with road congestion. There are a tiny handful of other sites that could follow Vilvoorde and the last two plant closures, announced in 2006, of Peugeot Ryton and Opel Azambuja. In December, Fiat CEO Sergio Marchionne said individual European government subsidies have led to 30 percent production overcapacity in Europe and redundant factories, a problem that should be fixed by streamlining the sector as the United States has done. "The need for rationalization is now undeniable," Marchionne told the Peterson Institute for International Economics in Washington D.C. "They're looking at the trees but they aren't seeing the forest." He said the Obama administration solved U.S. overcapacity by shepherding General Motors Co. and Chrysler through bankruptcy last spring. 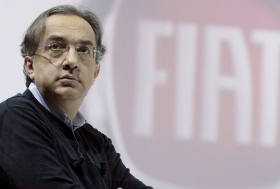 "There was a courageous structural shift in the U.S.," Marchionne said. GM and Chrysler emerged from bankruptcy "clean, with no overhang," he said. Marchionne complained about France's decision to protected domestic automakers Renault and PSA/Peugeot-Citroen by providing each with a 3 billion euro low-interest loan earlier this year. Fiat has said it plans to halt production at its Termini Imerese in Sicily by 2011. Analysts say Mitsubishi's Dutch NedCar plant might find itself in the crosshairs depending on the form its deepened partnership with PSA takes. Jaguar Land Rover plans to shut down one of its three UK sites by 2014. None of these, however, is churning out 250,000 cars or more per year, so their disappearances would make only a small dent in the utilization rates. Stefan Bratzel, an auto industry academic at the University of Applied Sciences in Bergisch Gladbach, says GM could cut deeper. "The idea of closing just one, if at all, is sub-optimal and even that appears to be negotiable. They need to concentrate their manufacturing in certain sites and not continue to have a little bit of production everywhere," Bratzel said. GM is set to make its decision on Opel in early January. Rudi Kennes, labor leader at Antwerp, hopes GM cannot afford to spend an estimated 400 million euros ($573.2 million) to close the plant, which he said could earn half a billion euros over the next eight years. "If they don't want that, then clearly it's just a political decision," he said.